I'll never do you no harm. Don't ever leave me alone. Well, you know I nearly broke down and cried. Well, you know, I nearly fell down and died. I'll never make it alone. I'll never let you down. "Oh! Darling" is a song by the Beatles composed by Paul McCartney (credited to Lennon–McCartney) and appearing as the fourth song on the album, Abbey Road, in 1969. Its working title was "Oh! Darling (I'll Never Do You No Harm)". Although not issued as a single in either the United Kingdom or the United States, a regional subsidiary of Capitol successfully edited it as a single in Central America, having "Maxwell's Silver Hammer" as its B-side. It was also issued as a single in Portugal. Apple Records released "Oh! 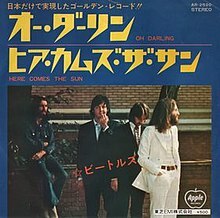 Darling" in Japan with "Here Comes the Sun" in June 1970. ©1969 Sony/ATV Music Publishing LLC. All rights reserved. Used by permission. One of my favorite love songs from Paul. Coming directly after Maxwell, it makes Paul appear to be saying "Didn't like that? Well here's this." Intricale piece of Abbey Road.